"The guys adapted to the space well, performers were amazing. MC was cheeky and good with crowds. The event was very successful from our side and were happy Team Extreme were a part of it. We look forward to working with you again." " Team Extreme provided a variety of activities, demonstrations and workshops which cater for all skillsets. The event went very well, people were interested in the activities for the entirety of the day which demonstrates that you had prepared a varied programme capable of holding the participants attention. Excellent staff that can keep the kid's interest, would certainly book again!" "The feedback we got from the crowd on the day was all positive, it was great for the young ones to see the Pros do their thing, giving tips and encouragement. They were all asking for a yearly event down there..... we'll see what funding allows but BIG SMILES all round." "Danny and his team were the highlight of our event. Not only did they show great patience coaching the young people on the mini half pipe, their demonstrations were a huge success and they helped out by judging their discipline in our own competition. We are already looking at funding streams to bring Team Extreme back in a larger capacity next year." "I just wanted to thank you and Team Extreme so much for all your assistance in ensuring the Super Sunday Skateboard event was a success. Having very little experience on boards, bmx & scooters it was a baptism of fire (for me). But from the initial enquiry to the boys delivering the day I can’t thank you enough for your professional yet friendly approach. I had boys travel over 2 hours to come and join the event and we have received some lovely comments from the parents who spent the day watching their children in absolute bliss learning new skills and competing with their peers. To repeat a comment from one of the Mum’s ‘ this is wonderful, such an amazing opportunity and a great experience for my boy'. I am part of a very small team at Its Magic and I never really had the chance to thank the boys on the day as I was heavily involved in organising so many things, please pass on my sincere thanks for their calmness, professionalism and talents." "The Team who arrived were very helpful. We were running a little late but they were happy to work around our delays. The performance was enjoyed by all and was a great spectacle for our event. Jason Forde deserves particular recognition for his incredible control of the bike. 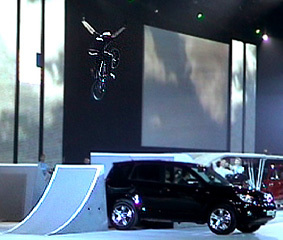 Team Extreme are a real spectacle and a great addition to any public event. Thanks very much for an amazing show, we are sure we will use you again." "The guys you sent down were first class and provided us with a great visual activity that the public could actually engage with as well as watch. Everything from the set up to the delivery was exactly what we expected and didn’t disappoint. The feedback from participants was really positive and you also featured heavily in the local media including a double page spread in the Hull Daily Mail and coverage on a local TV news station. We look forward to working with you in the future." "Without a shadow of doubt, this was the best event we have held so far! So thank you and Neil and Team Extreme! Neil was his usual brilliant self...in fact he excelled his usual standards of brilliance and went that extra mile for us. It's great to see someone like Neil return so many times and build up his special repertoire with the local kids - they all love him. So on behalf of us all at Newport SK8 & Ride and Newport Skate park, we thank you for all the work you have done for us over the last five years and look forward to bringing you in again in the future." "An amazing spectacle and an essentail part of the event. It attracted spectators and particpants of all ages. A professional, adaptable, and very pro-active team. As event organisers we look forward to working with them in the future." "I'm very happy with the service provided and I would not hesitate in recommending Team Extreme to run an event. Their skills were very impressive and they ran the competitions in a very professional way which allowed all participants plenty of time to show what they could do. " "I cannot thank you and your staff enough for the quality and the intensity to which you all worked on Sunday, making the event the success it was. Without your support and coverage, this simply would not have been possible. I would be most grateful if you would pass on my sincere thanks to your team for all their hard work and ensure that they have sight of this letter. Once again, many thanks for your contribution towards the success of The Liverpool Festival for Health 2012 and I hope that we will continue to enjoy a thriving partnership in years to come.
" Team Extreme have supported our event for the last two years and have always provided a fantastic service both on-site and bookings. What really struck me this year was how many of the kids remembered their experience with Team Extreme last year and had returned to the festival purely to have another go. I would have no hesitation in recommending them for any youth focused event." "The month long tour of Turkey finally ended yesterday and today after a last shopping and city tour we will be putting the guys and the gals to the plane for their trip back home. They put on amazing performances and never lost the good mood and spirit. The client is very happy and is joining me with their congratulations. The team behaviour was exemplary and they did put in such good work I hope to welcome them again very soon. Thank you for your help and collaborations." "Please send my thanks on to the guys, they did a great job of entertaining everyone. Neil was brilliant and very helpful on the day, making sure the shows were put on despite the weather not being on our side for the first part of the day. The guys were fun, friendly, professional, and exceptionally skilled. Great entertainers for all ages, they really enhanced the day." " The Team Extreme lads were very friendly and professional. The workshops and coaching sessions were enjoyed by those who took part, and hopefully they have inspired a few more kids to get out and try a new sport." "The event looked great and we were very impressed with the talent of the guys that demonstrated. The calbre of perfomers was superb and we would certainly use you again. "I would like to express my sincere thanks to you for your outstanding service at the Liverpool Festival Health & Activity 2011, Liverpool Tennis Centre on Sunday 20th March. I cannot thank you enough for the quality and the intensity to which Team Extreme worked in making the event the success it was. Without your support and coverage, this simply would not have been possible. The professionalism and energy of your staff was particularly evident and pivotal in ensuring the events' success. I would be most grateful, therefore if you would pass on my sincere thanks to them for all their hard work." "I wanted to say a quick thanks to all of you at Team Extreme. The guys were fantastic to work with, punctual, professional and reliable. They put on a great performance at the Yas Marina circuit and people loved them! We will definitely look to work with you again so please pass on our sincere thanks to all." "I just wanted to take a moment to say thank you for supporting us on our recent SONY Street 2010 Roadshow it truly was immense and the best we have ever done. Your entire team of Skaters, Inliners and BMXers involved are a credit to your organisation. They made the event and particulary my seminar (Digital Imaging) the focus (Pardon the pun!) of the entire event. Danny Aldridge was immense from the start until the finish. He really is a grafter too... Whether it be making or taking down the ramp. Putting on a blinding show or just chatting to the people involved he was absolutely worth his weight in gold. A true star. Both Ronnie & Doug were great in ensuring everything went smoothly and both performed to a high standard throughout. I found them a pleasure to work alongside and always happy to meet the needs of our show. Alex Coleborn was the highlight of the final venue pulling Double Tailwhip after Double Tailwhip and even a few 900’s thrown in for good measure the ability of this guy at 18 years old is absolutely insane. A true gem in your organisation. Overall I couldn’t have asked for anything more from your guys. Fantastic from start to finish." " Everything about the show was great! The lead in, the guys and Ronnie on the day. I'm sure you will get bookings as a result of this. It was the highlight of the off water activities and all ages loved it. That night the kids set up some hired tables outside the marquee and set up some mini ramps and were trying to do the tricks the riders did until late." "It was a fantastic experience that was enjoyed by all. The team that came out, we will be asking for them personally (next time) because of their interaction skills. The young people related to them and gained a great deal from the whole day. Due to the team and how successful it was there are plans to do this again next year. Thanks for making this happen and sending out a very professional team who provided the skills we required for everyone. They not only showed amazing tricks but taught others some to. Thank you to you and to the whole team we hope to see them again very soon." " Mike Mullen has been an excellent BMX coach and organiser/commentator for the Jam Events at Cottons. He is very flexible, accomodating and excellent at engaging with young people, who learn much from him. Team Extreme offer top class coaching, demos and events. Over the last two years, they have delivered a range of urban sports activities in Havering to benefit 100's of young people into Skateboarding and BMX'ing. I recommend their services to any organisation or borough looking to develop urban sports programmes for young people of any age." " We were very pleased with the whole package provided by Team Extreme from initial information request to packing up of the equipment on the day. The guys were very flexible in their approach and very easy to work with. Show times and even allowed the unicycle team to share their power which was excellent. They were very accomodating with visitors wishing to use the ramps, a good day was had by all. Many thanks to everybody at Team Extreme. Would hire back and recommend in a heartbeat." "Well done Team Extreme, you really captured our young people's hearts, Tipton skatepark was really put on the map on Saturday. Thank you also to Disney XD for all the free goodies you provided on the day. Please see attached letter of thanks from not only our community but from South Tipton Extended Services, you where all SUPERSTARS. We cant wait to work with you all again real soon. "The way the team, led by Doug, set up their ramp so quickly and efficiently and fitted it to work on our set was superb - we couldn't have asked for better. Danny and Adam's skating was exceptional, I would certainly use the team again for future jobs. Many thanks for making such a great show. " 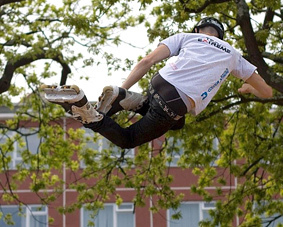 "Where does one begin to thank Team Extreme for the wonderful role they played in the 2009 Liberation Celebrations? The guys were simply terrific and were unquestionably the biggest highlight of the day. From a personal point of view, may I say that Doug was a true gentleman and professional from all my dealings with him leading up to their arrival and during their weekend in Guernsey. He is a credit to Team Extreme and his sport...Planning is well underway for 2010 and there's no doubt we'd love Team Extreme to be back for next year." "I would like to say a massive thank you. I thought Danny, Kyle and Jak were fabulous, not only were they professional but also a pleasure to work with. They really got into the spirit of the show and I loved their positive attitude. I am sure they will be an inspiration to all our viewers." "Danny and his team were fantastic, their presence added the 'X factor' that we needed to make this event a success. YLD Xtreme has received some excellent feedback, and is definitely a project we would like to work with Team Extreme on in the future." "Just to let you know that the client were very happy indeed with the team's performance and professionalism on the night. Thanks from us and from the client, and hopefully there'll be more we can do together in the future." "The event was attended by 1400 young people from across the North west, with participants having an excellent experience in skateboarding. Hopefully this has stimulated an interest to participate in lifelong physical activity and to continue to engage with the Street Games projects in their local area. Your help with the event was invaluable and we greatly appreciate your help prior to, during and subsequent to the event. We look forward to our continued partnership and hope that the day was as enjoyable for you as it was for the young people who took part." " The kids loved the day with Team Extreme and that is the main thing, however from a set up point of view it also could not be any better it was very simple and easy to book and get everything together." " On behalf of The Emerson Park School, thank you, for all the administrative work you put into our BMX booking for March 21st, and a resounding thank you to Mike and Denis for being so wonderful to our pupils on Saturday. They were charming, polite and extremely kind to every child, totally professional yet fun. Everyone had a great day. They learnt so much, improved all their own levels of skills. Can we do this every week! The photos I took on Saturday are up on the screens already. I hope we will have some more available funds to use your company again in the future." " Just a quick note to say yesterdays event at the building site of the 2012 Olympic BMX track went very well so many thanks for your help. We got some good media coverage thanks to Doug and Kyle’s display – we received coverage in the London newspapers and also a piece on BBC London. Thanks again for your help – if you could also forward this to Doug and Kyle that would be great." " The Team were fantastic yet again and very popular with our visitors. As always the booking process and subsequent arrangements all went very smoothly and the riders and team leader were very friendly and professional when they arrived. It was all very positive from our end and we had excellent feedback about Team Extreme from our visitors. We hope to see you back next year!" " Our team were very impressed with Jak Tonge, the skateboarder supplied for the HSBC advert. He was professional, positive and quickly understood what we needed and then nailed it on the first take. We would not hesitate to work with him again and I will recommend Team Extreme to anyone looking for skaters/riders for shoots in the future." " I'm writing to thank you (Valerie) for your personal contribution to making this years HUB Festival an amazing success. The feedback regarding the custom skatepark has been great and has helped boost the profile of the Festival. I'd also like to thank Neil and the rest of the crew for their contribution as they are the real stars of the show. It has been a great pleasure working with such an easy going team on site, makes all the difference!" "Hope you and the team enjoyed the Toyota European Retailer Event last week. As ever it was a pleasure to have you chaps as part of the team and the show. Your ability to hit your marks and perform such a tight show within a big production always amazes me. you involved in one of our other projects in the near future." "The team on the day were, as always, fantastically helpful and extremely entertaining. It is an element of our event that always goes down well and we are very happy with our relationship with Team Extreme. We hope that, as long a we always get our funding, that we have Team Extreme every year." "Thank you for an excellent show. Your guys were a pleasure to work with. You will definitely be back!" "I can honestly say that Team Extreme halfpipe show was the most successful event we have held at Dockside Outlet Centre yet. I found the guys professional and exceptional at what they do. The show was incredible and the locals certainly enjoyed the coaching sessions. Look forward to you returning next year." "I wanted to let you know how impressed I was with Team Extreme. From the start of the booking process to the end of the event, the guys were super professional, friendly and amazingly talented! Feedback has been superb and our sponsors were highly impressed with the set up and shows. The local skaters were blown away and I'm pretty sure your team have inspired many young riders in Jersey. Doug was a fantastic team manager and went out of his way to make sure everything ran smoothly. I will recommend Team Extreme to anyone running events over here and without a doubt be booking again in 2008!" "A little note to say a massive thank you for providing two great activity areas at the World Scout Jamboree 07. Once again the street course and mini ramps were inundated with hundreds of young scouts each day. The show standard remained high over the two weeks and were very well received, particularly by the Americans! It was great to work with you again, I look forward to working with you at the next one." "We would like to take this opportunity to thank everyone from Team Extreme for helping to make the London Motor Show a great success for Opel/Vauxhall. We were all very impressed with the talent of all the skaters, boarders and riders. But on top of that, their enthusiasm to perform was fantastic! Even though the run was over two weeks with five shows a day, there was always great energy in that half pipe. You really felt all the performers were having a great time and that really helped to make the Vauxhall stand “fun”. For the GME press conference, we appreciated all your efforts in helping to create the “perfect image” for the world premiere of the new Opel/Vauxhall Corsa. From my point of view, I was also particularly impressed with your professionalism. From our first meeting to discuss the project; all the detail planning you do in developing your routines; building enthusiasm at client meetings; and finally your work ethic during a very tight on-site rehearsal schedule. Again thank you for helping us to deliver a very successful event and we look forward to working with you again in the future." "I very much wanted to say how happy we were with the show! It was amazing. 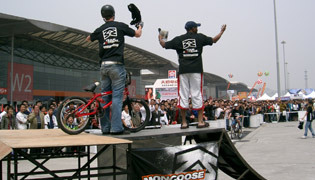 Especially the show arranged to celebrate the announcement of Mongoose sponsoring the Chinese National BMX team for the Beijing Olympics in 2008! We were all very pleased with how things turned at the Shanghai Cycle Expo 06"
"Please pass on my best wishes to Mike and the rest of the lads who thrilled us all with their shows on saturday at Lockerbie Gala. From meeting the lads as they left the motorway to saying goodbye whilst removing the ramp, they were a credit to your company. We've had nothing but positive comments from all sections of the community, which speaks volumes for their ability. 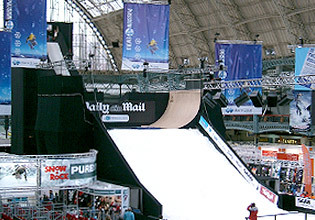 I would consider the Vert Halfpipe show which you provided excellent main event entertainment and superb value for money. We look forward to working with you again"
"Many thanks to Team Extreme for successfully running the competitions at Anchorage Lane Skatepark, in particular responding to the requests by the over 15 bmx group for a jam element to be added to their section of the competition. Apart from that, Team Extreme were professional at all times, turning up to set up early, were willing to do anything that was asked of them and built up a good rapport with those they were coaching and the riders in general." "From my initial enquiries, to the final farewells at the end of the day, Team Extreme were professional, efficient, friendly and great fun to work with. 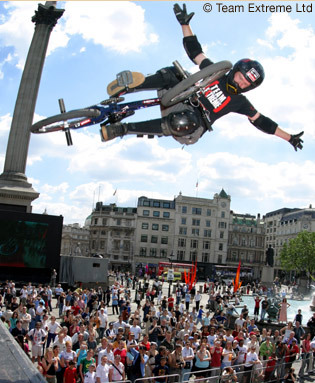 The Bike Fest show was awesome and brought Trafalgar Square to a standstill every time. Nice! I hope we can do it again next year." "Filming today was superb, Terry Price was incredible on his micro scooter and we got a superb front flip on tape ready for tomorrow's program. Doug and Will were great and even secured cameo roles in the show! We would definitely like to have the ramps back here and perhaps get some of your others riders to do more stunts." "I would like to take this opportunity to thank you and your staff for their efforts within our activity programme in Basildon & Southend during half term Feb 04. I have found this experience working with your company extremely satisfactory, as your flexibility and willingness to adapt to any given situation supported the delivery of our project. Although, at times, my demands may have exceeded our booking with you, I was pleased that you were still able to meet with our requirements throughout the week, while remaining professional at all times. The shows that your team put on were inspirational, and really attracted the young people to the Centre. The support that your riders also gave us with regard to instruction on the skate park that we had provided was much appreciated by both the young people and myself." "Thank you for very professional on site approach to everything. The guys were always on time for the shows and performed exceptionally well. The unusual load in and de rig worked very well and there was plenty of crew to make sure that the project ran smoothly. It has been very enjoyable working with you all and the performance was well received by the audience and the client – DMG World Media. Thanks once again to everyone who was involved." 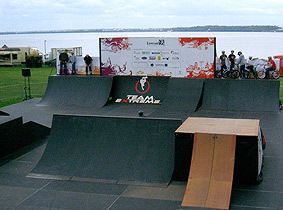 "We are happy to recommend Team Extreme for their completely professional approach to the Halton Skatepark Awareness day (March 2005). They were punctual, happy to clear the site before cleaners arrived, friendly and helpful. They came up with the ideas for the workshops and competitions and provided a good range of prizes. We have had excellent feedback from members of the public who were pleased with their friendly approachable attitude. They worked with a large range of age and abilities and everyone got something from the session. We would definitely use them again."